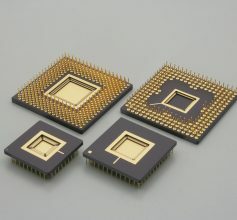 This package is one of the most common for Server, MPU and high performance ASIC designs. Micropin, (SMT), interstitial, and standard thru-hole matrix styles are available. HTCC materials are available. Please refer to the material properties of the table with respect to material properties. Micropin, (SMT), interstitial, and standard thru-hole matrix styles are available. Heat sink or heat spreader options are possible for high power dissipation devices. Available for Wire Bond or Flip Chip die attach. Products can be ordered individually or in lots as needed. We also offer optimal designs and standard products to customer needs.